OS DESEO A TODOS/AS FELIZ SANTA CECILIA 2017. 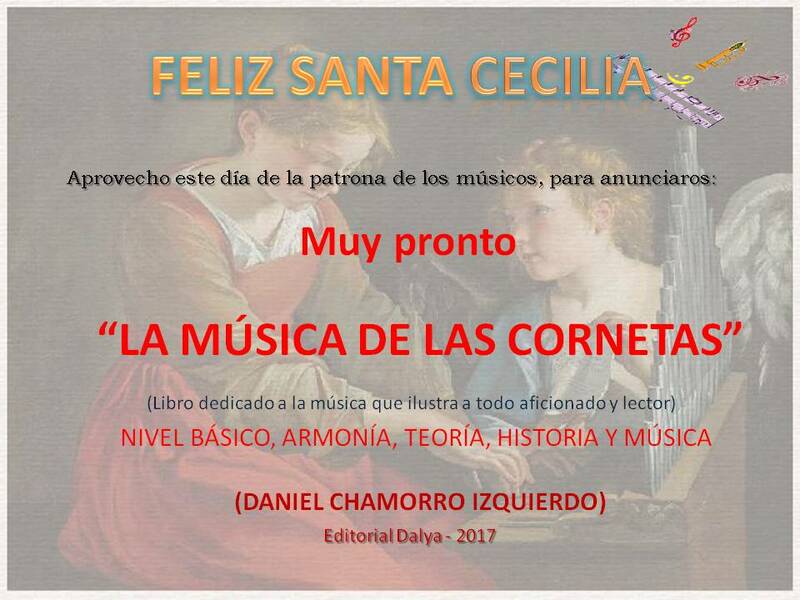 APROVECHANDO DE ANUNCIAR EL LIBRO DE "LA MÚSICA DE LAS CORNETAS" DEDICADO AL MUNDO DE LAS BANDAS DE CORNETAS Y TAMBORES, AGRUPACIONES, ENTRE OTRAS FORMACIONES. UN LIBRO QUE INTENTA ILUSTRAR A TODO MÚSICO, AFICIONADO Y LECTOR. CUALQUIER LECTOR PUEDE DESCUBRIR LA HISTORIA DEL PATRIMONIO MUSICAL EUROPEO-ESPAÑOL, ENTRELAZADOS ENTRE SÍ MEDIANTE LA HISTORIA, ARMONÍA, EFEMÉRIDES, EMOCIONES Y TRADICIONES.